August | 2013 | Small Farmers. Big Change. Coming Soon: Farmer-Owned Fair Trade! 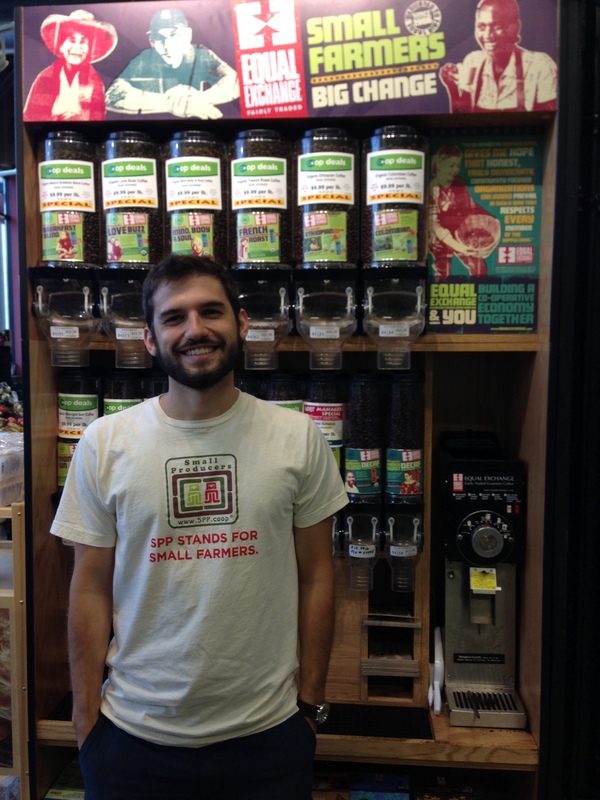 The first Fair Trade farmer-owned certification system, referred to as the Small Producer Symbol (SPP, for its Spanish acronym) will arrive this fall on Equal Exchange coffees in food co-ops and natural food stores across the country. 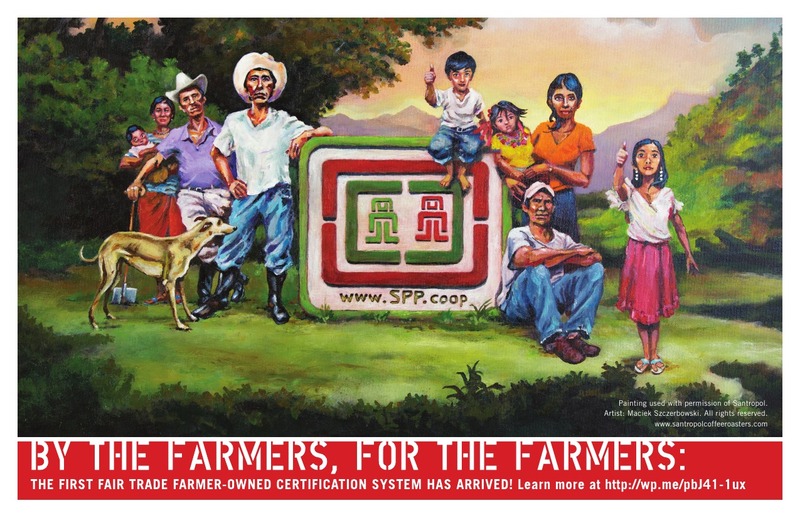 Ten years in the making, the SPP certification system represents the small farmers’ persistent attempt to ensure a more just trade system for their fellow farmers everywhere. The colorful SPP logo will initially appear on Equal Exchange coffee bags and bulk coffee bins, and will soon become more prominent throughout stores. While the SPP itself is just a little logo, in actuality, the real symbolism of this new Fair Trade seal is anything but small. This bold step forward reflects the fact that today the very folks for whom the Fair Trade movement was built are taking a leadership role in shaping their own destiny. The potential impact this new system will have on small farmers, their co-operative organizations, and the entire Fair Trade movement could be quite profound indeed. In the early 1980s, a division in the Fair Trade movement resulted in the creation of one international certification system with two distinct ideologies. The early founders of Fair Trade recognized that small farmer organizations trying to access the market were operating on an unfair playing field. The founders’ goal was to create a system that could right the wrongs of hundreds of years of colonialism and unjust trade. Once the system was underway, other traders wanted a faster way to put Fair Trade products on the shelves and decided to open up the system to large-scale plantations. The fact that plantations have one owner (versus being owned collectively by a democratically run, small farmer organization), and generally have more access to resources, it is usually faster and easier for them to move products from origin country to market. This means that plantations, with their ease in accessing bank loans, infrastructure, market information, technical assistance, and networks, will almost always carry the same advantage over small farmers that Fair Trade was designed to address. Eventually, the international Fair Trade certifying system, Fairtrade Labelling Organization (FLO) allowed plantations to become a source for almost all Fair Trade products, with the exception of coffee, cacao, and a few other categories. Small farmer coffee and cacao organizations, typically the most advanced and successful Fair Trade producers, have been living with the fear since the division occurred that the Fair Trade system will one day open their products to plantations as well. Should this happen, many believe that they will once again become marginalized and lose their hard-won market access. After all, if it’s easier to source coffee and cacao from large-scale plantations and still call it “Fair Trade,” why wouldn’t multinational corporations simply take the easier route and ignore the small farmer? In coffee, it took 15 years of Fair Trade before coffee farmers began to see a positive impact on their businesses and in their lives. Sourcing from plantations in tea and bananas has prevented the growth of a strong small farmer movement in these two categories. (For more information on how growth in small farmer tea was inhibited by plantations, click here. The farmers’ fear became more of a reality 10 years ago. At the 2003 annual Specialty Coffee Association of America conference in Boston, coffee certainly wasn’t all that was brewing. Alongside the aromas emanating from the brewing of exotic coffees, big trouble was simmering as well. The foreshadowing of conflict was evident from the loud voices and angry faces of representatives of small farmer co-ops, Fair Trade roasters, alternative traders, and other Fair Trade activists, all of whom were tightly packed in a room at the Hynes Convention Center listening to the words of Paul Rice, CEO of Transfair USA, FLO International’s U.S Fair Trade certifying agency (today known as Fair Trade USA). Rice was lobbying for a change in standards; he believed plantations should be allowed in the Fair Trade system as sources of “Fair Trade” coffee. He claimed that large companies and corporations wanted access to plantation products and that there wasn’t enough small farmer Fair Trade coffee on the market. The crowd was wild with outrage. Most small farmer organizations had far more coffee than they could sell on Fair Trade terms and many more organizations of small coffee farmers were waiting for buyers to get themselves listed on the Fair Trade register of certified producers. Finally, against a storm of protest and outrage, Rice acquiesced and agreed to drop this controversial strategy. Although Rice publicly backed down at the SCAA conference, small farmers, roasters, and other Fair Trade activists knew it was just a matter of time before the issue came up again. The pressures to grow a system quickly, the needs of plantations and big corporations, and the money behind it all, were heavy reminders of how decisions are made and how trade typically occurs. Sure enough, in September 2011, Transfair USA announced its decision. Taking the name Fair Trade USA, the organization left the international Fair Trade system that had given it birth. Just days later, it announced its new strategy, “Fair Trade for All”, with a certification system allowing plantations in coffee and cacao. Small farmer organizations weren’t idle. The Coordinating Body of Latin America and the Caribbean (CLAC) had been meeting for 10 years to strategize how to keep Fair Trade from being stolen out from under them. Finally, they had their solution: the Small Producer Symbol (SPP). CLAC has now created its own certification system, run by the non-profit group, the Foundation of Organized Small Producers (FUNDEPPO). The system is impressive, with General Standards incorporating four dozen criteria for small farmer member organizations, including maximum individual farm sizes and a maximum percentage of farm work performed by hired farm workers. Buyers who use the SPP must meet nearly three dozen criteria, including a minimum of five percent annual volume growth in program purchases. Perhaps most impressive, the SPP is run and governed by the farmers themselves. After decades of this movement being essentially managed by offices thousands of miles away from source, farmers are now in the driver’s seat. This fall you will begin to see the first Equal Exchange coffee products appear with the SPP symbol on them. 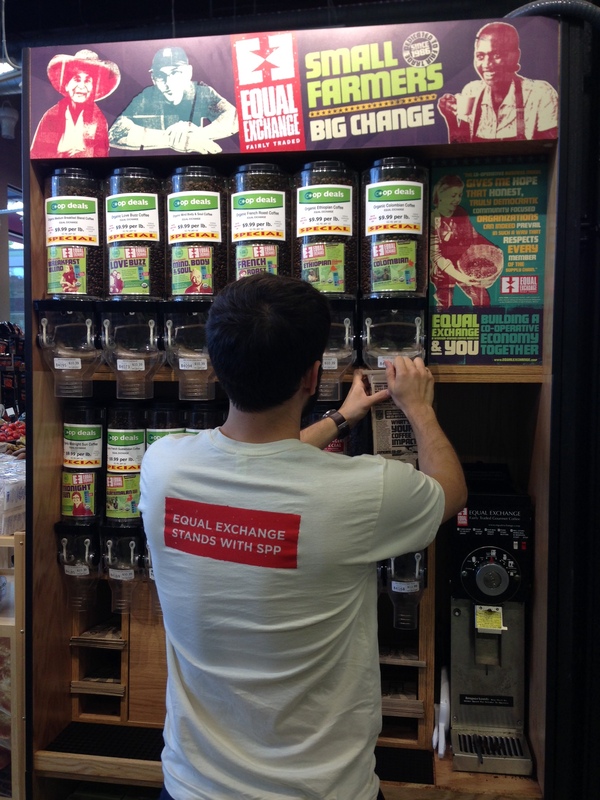 Trust that while other Fair Trade products may come from plantations, SPP coffee will never sell out. It will always be authentic. It will always be small farmer.